Transforming Faces partners with the Cleft Team at Yekatit 12 Hospital in Addis Ababa to provide comprehensive cleft care to children. 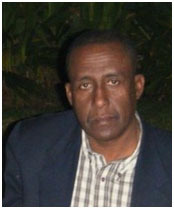 We’d like to introduce you to Dr. Mekonen Eshete Abebe, a plastic and reconstructive surgeon at Yekatit 12 Hospital in Addis Ababa and a teacher at Addis Ababa University School of Medicine. During the Cleft Congress in Orlando, Dr. Mekonen presented during Session #12. According to his presentation, approximately 85% of Ethiopia’s population lives in the rural regions and there are about 80 different ethnic groups and 70 different languages. While the exact incidence of cleft is not known, the incidence is Addis Ababa is believed to be 1.49 per 1,000 births. Yekatit 12 Hospital was built in 1923 and their cleft unit began in 2003 with the support of the Norwegian government. The cleft team consists of plastic surgeons, speech therapists and assistant speech therapists, orthodontists, orthodontic technician and oral hygienist, ENT surgeons, social worker, nurse coordinator and a pediatrician. We met with Dr. Mekonen and asked him about his involvement with the project. He says most parents, one week after their initial visit or referral, are completely changed and are ready to participate fully in treatment. They provide re-assurance to the parents but they also note that parents must fully participate in order for their child to get the best possible outcomes. Find out more about our work in Ethiopia.